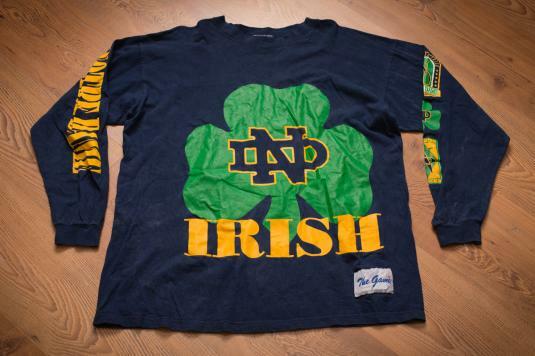 Vintage 90s Notre Dame Fighting Irish t-shirt with a huge logo graphic. It is in good vintage used condition with wear, fading, pilling, lots of lint or something fuzzy, some cracking on the graphics, and a repair on the top of one shoulder (shown in last closeup photo). ***Don't go by the tag size! *** - Use measurements to ensure proper fit. Actual Size: Modern large to XL? – Length 28.5" – Pit to pit 23" – Pit to sleeve end 21"
????????? ??????????? ?????? ?????? ? ??????? ??? ????? ?????? ??????? ?????????? ? ?????? ??? ? ?????? ????? ?????????? ?????????? ??? ?????????? ????????????? ?????????? ???????? ?????? ??????????? ? ? ??????????? ??????????????? ?????????? ?????? ???? ?